World 2-2 is the second course of World 2 in Super Mario 3D Land. This level takes place in a dark underground area with poison and a flashlight that spots Mario. The icon for the course is a cave with poison at the bottom an a path of Flip Panels above it, alongside a ? Block. There are two ways. Above, green panels are found and conduct to the regular way, that contains a Star Medal. Under it, there are two Paragoombas and a Warp Pipe, which leads to a small room with the word "3D" made of coins. The next area is mostly a pool of poison that Mario can cross only by the Flip Panels. In this area, some ? Blocks and another Paragoomba are faced. At the end of the poison, Mario can use the Midway Flag and a reproducing coin. Soon after, another poison pond is found, this time, bigger than the first one. After that, Mario will reach a small area with a Warp Pipe that lead to the Flagpole. Mario can reach the top of it only by activating some green reproducing panels. Star Medal 1: At the start of the level, it can be collected easily by going up on the first Flip Panels. The Star Medal is a bit behind the area. Star Medal 2: Right after the Midway Flag, a hidden area exists in the ceiling. Mario can reach in the elevated area after the Midway Flag by a hole in the left part of the place. Star Medal 3: On the outdoors final area, the wall in the left side have some Brick Blocks at the bottom part. Mario can break them with a somersault or Tanooki Mario's tail. 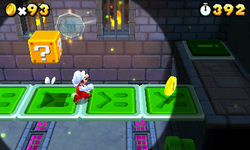 The Star Medal is in a small corridor behind this blocks, where Mario must wall jump in the far behind wall. This page was last edited on April 5, 2019, at 18:06.